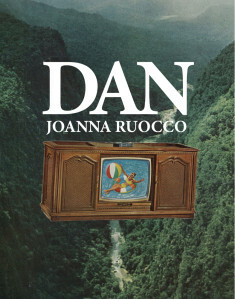 In 2011, David Carroll Simon wrote an excellent piece on Joanna Ruocco’s earlier books (Mothering Coven; Man’s Companions); she has published several more, and I’ll write about the most recent: Another Governess/The Least Blacksmith (FC2, 2012) and Dan (Dorothy, 2014). Simon thought about Ruocco’s materialisms: “She has a habit of literalizing metaphor, materializing meaning and leaving it to her readers to parse the intersection of worlds linguistic and sensual.” Materialize your meanings and they cease to mean; they are absorbed, reabsorbed, into a finer movement after all, or after all, into movement. Movement can’t mean; it, by what it means, can’t stop. Meaning is death. I am thinking of Henri Bergson, writing in Matter and Memory: “But the truth is that the movements of matter are very clear, regarded as images, and that there is no need to look in movement for anything more than what we see in it.” Bergson moves in the novels of Woolf and Beckett, in sentences that dally in sensation (Woolf) and go despite nothing (Beckett); The Unnamable’s moving ending: “. . . you must go on, I can’t go on, I’ll go on.” Ruocco writes to move matter; in a Ruoccan sentence, material operates as the image of the sentence, a figural singing out of the sentence as such, this dark matter, earthen, a realism not of a fiction but of the writing. In Another Governess: “She mixed yeast and water for the baker.” This sentence is an image, a literalization, of the sentence itself, a writing that wills the mixture of materials, puts nouns at each other’s mercy: the force. Blood runs up my nose. Blood runs over the lower lids of my eyes. The housekeeper is red. Her shovel is red. I fit my hands inside my neck, all ten knuckles in my neck, but blood comes around my knuckles. My head falls forward. I get on my knees. I put my hands on the floor. I put my head on the floor. The dust makes me cough. I spit blood on the floor. I thicken the dust. I stir with my hands. The dust is thicker and thicker. I swallow blood with my mouth and it comes out my neck. Ruocco works with several nouns (blood, dust, knuckles, mouth, neck . . . ), leveraging them in different combos until disgracefulness can reach a pitch, when things find the right, the egregious-est hole from which to ooze. It’s a feminist project to be a disgrace (a public problem) — Leaves of Grass, House of Leaves? Leaves of bloody rags. Ah, better. Instead of engaging in a traditionally phallogocentric project of movement toward meaning — closure — Ruocco moves into the most oozing hole: “There was a hole in the lump of my foot, and the hole leaked yellow fluid. I pulled dark strings from the hole with my fingernails.” She tracks holes. She knows this anti-closure is from where these sentences can come. A forge is a gaping hole of fire; in The Least Blacksmith, Ruocco makes more holes on top of holes, in a burning face, “There was a hole in our father’s nose. It was big enough to hold a cigar,” and the hole of a brotherly mouth, “Before I go to bed my brother wants me to put him in my mouth. He opens his pants and turns his chair to the side.” Holes become the site from which to make more work — the psychoanalyst and second-wave feminist theorist Luce Irigaray contested the Lacanian conception of a hole as a site of pure lack. There is actually stuff in there, even God, Irigaray conceives. Ruocco, too, knows there’s an awful lot of stuff in holes. She stigmatizes, feminizes what she can, face, mouth, foot, makes marks of lack, her joyous lack of meaning, reasons, from which to pull black strings. Melba is subject to a lot of mansplaining! Don Pond, a customer at the bakery she works at, reasons out their whereabouts for her: “Landlords own multiple properties, often non-contiguous. And if my house is in fact separate from the bakery, which it is, and you are in my house, which you are, then you are not in the bakery.” Melba can read as incorrigibly naïve, or rather, invested in the affect of naiveté as a mode for survival. In Don Pond’s house, Melba muses: “Like any female in a male’s house, she thought, I am being struck with ways to make improvements. She smiled, relieved to find that she had surrendered her contested singularity and merged herself with the anonymous multitude of women in general.” Melba evades the option to opt-out; she circulates through these closures for some reason. Perhaps Dan counters the horror of striking off alone, of anarchy, or even a healthy little dose of second-wave feminism — it tries to negotiate, to keep the movements of perception running through a constantly closing, and interruptive, system. But the system is so irritating. Melba’s landlord calls to chide her about not doing her dishes, and it takes pages. These pages seem to steal space from Melba, which she would need for reverie, privacy, for the novel to find some other foot, which it can’t. Melba, and so, Dan, is constantly interrupted with lectures, abductions, and increasingly sketchy formalities. Melba’s mother lectures her at length about using depilatory creams and why she should go shopping; Don Pond has her lie down on a table covered in paper in his house because “It’s important to make yourself comfortable.” Dan is a novel of tedium — the tedium of what people say to you, put on you, of having to deal with all of these motherfuckers, and in Melba’s case for whatever reason, to deal with them kindly. Tedium of surrender. Melba felt that she could establish, briefly, a sense of her location on earth. She could also establish other things. For example, her body had the consistency of a stone fruit, although with a different ratio of hard parts to soft parts, and those parts differently distributed. She had a keen sense of the human body — blemished and juicy, a lobe of oddly shaped flesh clinging to an oddly shaped pit — and of Dan, the endless thicket in which these bodies formed, growing in clusters but dropping one by one to rot in the understory, contributing nurturing ooze to the tangle of brambles and brackets ever-spreading their roots. The word “bracken” shot through Melba’s mind. She swayed. “Samovar . . .” She murmured the word just as “bracken” banged into it. She saw a spark that began to ripple and then she knew no more. Men in Dan are like a clock-strap that whips Melba into time, makes her more like time, less like space. Bergson writes in Matter and Memory, “In a word, the more immediate the reaction is compelled to be, the more must perception resemble a mere contact.” Time masters action where perception masters space. It is perhaps why Woolf had to pass perception around, to devise a selfless, shared consciousness in a novel like Mrs. Dalloway, whose namesake would merely be too busy. A little too fucked. Melba’s public life is a barrage of mere contact, of having to react, busily, in real time to accusations, abductions, estimates of her person and bodily intrusions: “The room is filling with hands, she thought. There are slots in the walls and in the floor and in the ceiling and men are poking their hands into the room.” In Dan, even a room is a hole, most disgraceful.